This dress represents the nexus between Pinterest as an innocent diversion, and Pinterest that makes you straight up crazy. 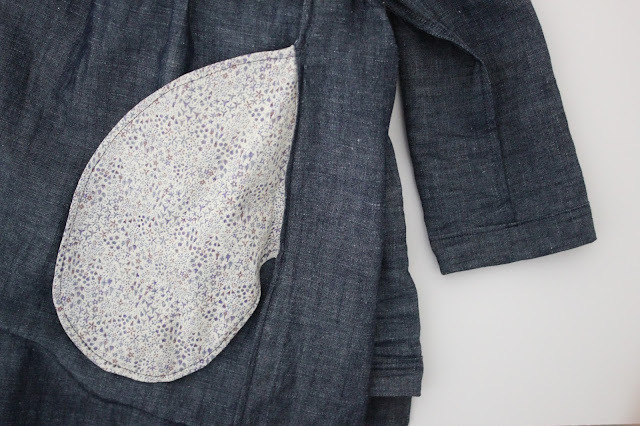 I saw this (follow link) little piece of chambray perfection from Samuji long enough ago that it isn't on their website anymore. But it is still stuck in my head. Sometimes pinning a picture of something I want is enough like possessing it that I can get over my wantiness for it. Virtual possession was not nearly enough for this dress. So, of course, 3 hours before spring break began, when I was supposed to be packing up kids and cat for a week at the farm to celebrate Easter with my family (and plant peas), I decided to try to squeeze a copy of that dress out of 1.5 yards of linen chambray earmarked for something else. No big deal. Right?! I suspect my inspiration had a closure of some sort up the back. I wanted this to be pull on, so it's a bit less fitted. I used the Scout Tee as my jumping off point for the bodice. I've made it a bunch of times (here, here, here) so I know the fit at the shoulders is spot on, and have played around enough with the sleeves and neckline to know that I could get the effect I wanted in the end. The skirt was the wild card. It seems simple enough, two gathered rectangles with pockets, but the proportion of a garment this simple is crucial. I took the skirt off a few times to get the height just right. Here are the insides. A fabric like this frays easily, and I don't want it to fall apart from careless washing (which is the only kind I do). I french seamed every seam so this garment would stand the test of time. The Sew Mama Sew tutorial for making french seams with in-seam pockets makes the whole mind bending right side/wrongsides thing pretty simple. I'm hoping the simple styling of this dress will keep it in regular rotation for a long time to come. The fabric is Robert Kaufman New Castle Denim (similar fabric) from Fabric.com. It is a chambray lover's dream come true. I might never buy another fabric. Everything can an erithral yarn dyed blue right? The accents at the binding are Libery of London. The big print is a scrap of Basics Tank, and the small floral is a lovely gift from my Secret Valentine. All in all I'm pretty happy with my reproduction. I do wish my skirt were a little fuller and more flared. Normally I'm over zealous when skirt gathering. This time I was a bit too conservative in the cutting, and a bit too short on fabric to do the skirt gathers justice. I'm considering buying more fabric and taking another stab at it just for the learning experience. Afterall, experimentation if half the reason to make your own clothes. Who is playing along with Me-Made-May? I'm hoping to wear a me-made everyday in May, I'll be posting a few times a week on instagram. I'd also like to make a couple of more involved projects that have been on my list since last spring. 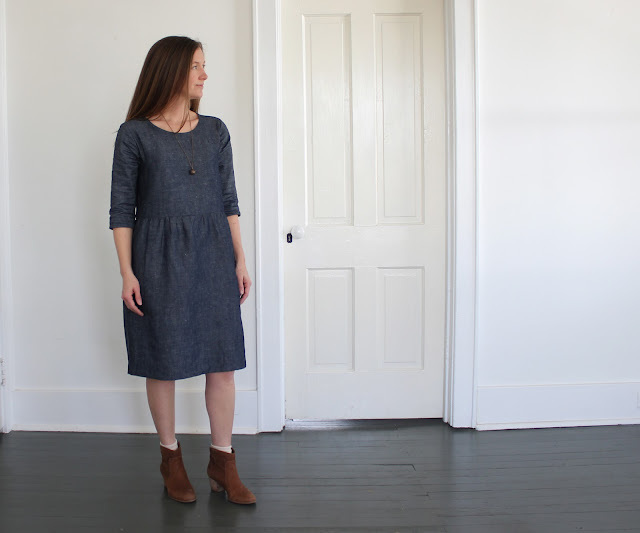 We'll see, I already feel myself getting distracted by another Alder Shirtdress, and some delicious AG Denim! I love this! And the fabric sounds so intriguing. I've had the Chambray dress from the Noodlehead book in my head ever since it came out, but I spontaneously cut into the fabric I had set aside for that to make a pair of Luna pants. Maybe I'll have to replace it with this denim, it looks great as a dress! I am participating in my first Me Made May, with a goal of handmade 3-4 days a week, as that is probably about all I have. My hope is for handmade everyday next year! I think it looks great. I recently tried to make something similar, using the Inari top and adding a skirt, and had trouble with the proportions- too wide, too many gathers, and too high on the waist and it looks maternity. I finally settled on two 36" wide panels but think I could have gone narrower. How wide are your panels? My skirt is two 25" panels. Must too narrow. Based on your info, I might try 30 or a little more next time. So hard to know, and I was too impatient to test it with a different fabric. Good luck with your next version! It's lovely! Looks like the perfect easy weekend pull on and go dress. Proportions look great to me! I pinned this dress and tried making it too! I started with the scout tee...but..Mine came out so maternity-esque..that I am seriously saving it for when I get pregnant (didn't bother to hem it yet). hah. Anyway, I want to try again...this time with a back closure of some sort for a more fitted look up top. But size 4 scout tee fits so well..for me, it's just not the right shape for what I want. Need to work on my drafting skills! Anyway, love how yours turned out! !